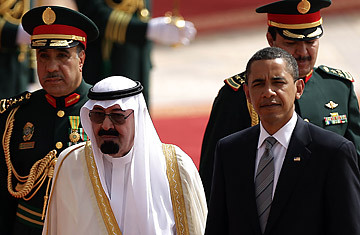 Saudi King Abdullah bin Abdul Aziz al-Saud (L) greets US President Barack Obama at the King Khaled international airport in Riyadh on June 3. The scene: a packed auditorium at a major Cairo university. The speaker: a leader in the U.S. government, with a compelling personal story. The message: American foreign policy is "idealistic." The world should embrace the "challenge of listening," while seeking "a new standard of justice for our time." On June 20, 2005, Secretary of State Condoleezza Rice delivered an ode to liberty, democracy and a bright future in U.S.-Arab cooperation to a group of students in Cairo. As an effort to sell Arabs on American foreign policy, it was a measurable failure: three years later, a piddling 6% of Egyptians told Gallup pollsters that they approved of the job performance of U.S. leaders. In appealing to the Muslim world, Obama starts with an advantage over Rice: his biography, which ranges from his international family, which included Muslim members, to his opposition to the Iraq War. As early as April 2007, candidate Obama had ventured that his unique story "allows me to say things to them that other Presidents might not be able to say." When it comes to policy, however, Obama's message becomes a tougher sell. He may have sought to distinguish his Administration from its predecessor on issues ranging from treatment of detainees to an exit date in Iraq and a renewed push for Israeli-Palestinian peace, including a tougher line against Israel's expansion of West Bank settlements. But many of the policies that most aggrieve the Muslim world remain intact, and any changes will be slow in coming. Obama arrives in Cairo as the commander of a military whose deployment in Iraq continues, while its engagement in Afghanistan is steadily growing. Civilian death from U.S. air strikes in Pakistan and Afghanistan continue to be a problem, while the situation in the Palestinian territories has deteriorated over the past year. Alterman's advice dovetails with Obama's diplomatic approach on previous trips to Latin America and Europe, where rather than try to paper over differences, he focused on changing the tone of the discussion. "Where there is resistance to a certain set of policies that we are pursuing, that resistance may turn out just to be based on old preconceptions or ideological dogmas that, when they're cleared away, it turns out that we can actually solve a problem," Obama said in Trinidad. Obama appears to believe that many of the world's most intractable problems can be alleviated by better communication and understanding. Similar themes are likely to be echoed in his Cairo speech: a call for dialogue and understanding that flows both ways, and which the Bush Administration, with its tin-eared visions of global transformation, sorely lacked. When Rice spoke in Egypt in 2005, she cast the democratic project as an American success story that would soon spread through the Arab world. "The day is coming when the promise of a fully free and democratic world, once thought impossible, will also seem inevitable," Rice promised the students. Rice's historical prescription fell mostly on deaf ears. When Obama stands before his own crowd of Egyptian students, he is likely to avoid her mistakes, and instead emphasize the need for a respectful conversation. See pictures of people around the world watching Obama's Inauguration.